When it comes to sandwich making, I don’t mess around. I’m not sure if this is a vegetarian thing, or a person-who-likes-to-cook thing, but even when I’m throwing together a midweek lunch sandwich, I find myself digging in the pantry for the best bread and loading it up with a dozen or so veggies and multiple condiments. And why wouldn’t I? Sandwiches are the best, and it’s always worth the effort! Stuffing good food into bread can only make it better, if you ask me. My favorite sandwich subject matter as of late is tofu. That probably sounds weird to anyone who hasn’t eaten a ton of tofu, but it works out really well. 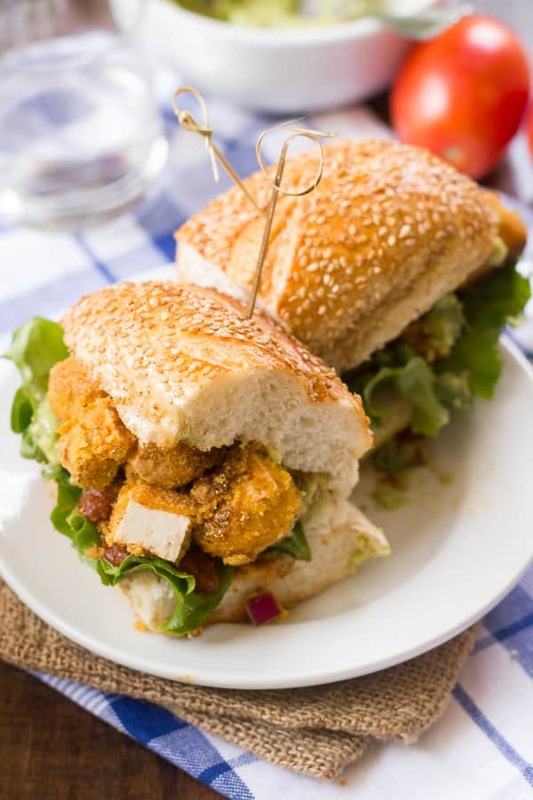 Tofu is packed with protein, so your sandwich will be nice and filling, it goes with anything, and makes the perfect vehicle for other tasty sandwich ingredients, in this case a spicy Tex-Mex inspired tomato sauce and crispy cornmeal coating. If you think you don’t like tofu, you need to try it with a cornmeal crust. I discovered this way of cooking tofu a while back, and since then I’ve been hooked. Normally I might be inclined to add some seasonings to the cornmeal coating and bind it to the tofu with a flax egg, but this time around I decided to whip up a spicy sauce that doubles as a binder and dressing for the sandwich. You roll the tofu around in the sauce before coating it up with cornmeal, and save the extra sauce for drizzling on the sandwich before serving. The tofu ends up being soft on the inside and crunchy on the outside, with a burst of spicy flavor in between. I whipped up some guacamole to use as a sandwich spread, and the creamy texture and tangy flavor went perfectly with my crispy tofu. The guacamole, while completely delicious, is made using a pretty standard recipe, so feel free to swap it out with store bought to save some time. These flavorful sandwiches are made with crispy cornmeal-crusted tofu chunks, spicy tomato sauce and creamy guacamole. Stir the tomato puree, hot sauce, lime juice, soy sauce, cumin and ancho chile powder together in a small bowl. Stir the cornmeal, salt and pepper together in a separate small bowl. Very generously coat the bottom of a large nonstick skillet with oil and place it over medium heat. 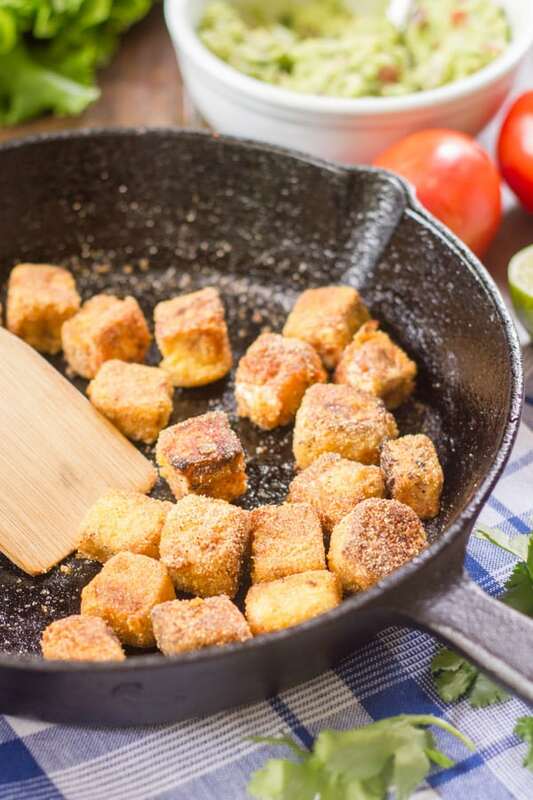 Add a few tofu cubes to the sauce mixture and toss to coat, then transfer them to the cornmeal mixture and gently toss until they’re completely coated. When the oil is hot, add the tofu cubes in a single layer, working in batches if needed. Cook until the tofu is lightly browned and crisp on the bottom, about 5 minutes. Gently flip and cook until browned on the opposite sides, about 5 minutes more. Transfer the cooked tofu cubes to a paper towel-lined plate. Repeat until all the tofu is cooked, adding oil to the pan between batches. Reserve any excess sauce. Place the avocados into a medium bowl and mash with a fork. Add the remaining ingredients and stir until well-mixed. Season with salt and pepper to taste. Stuff the sandwich rolls with tofu and drizzle with the reserved tomato sauce. Top with guacamole and lettuce leaves.